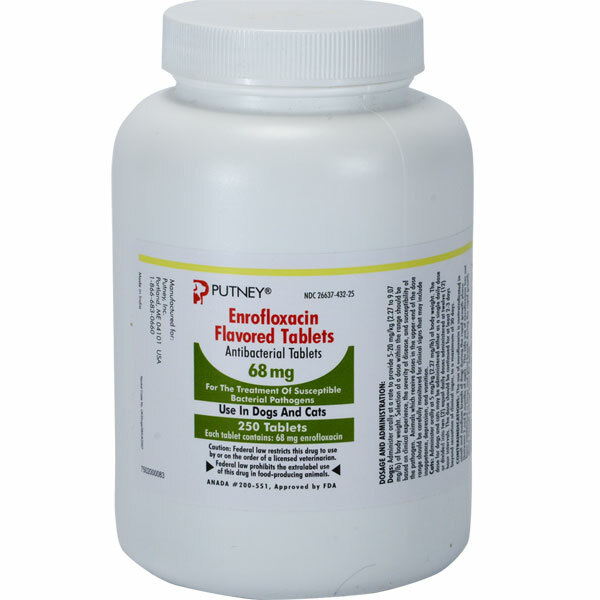 Enrofloxacin is used in the treatment of many types of bacterial infections including urinary tract, skin, prostate, GI tract, liver, and lungs. 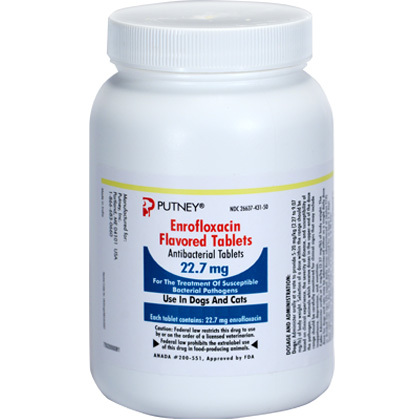 Enrofloxacin is the generic equivalent to Baytril and comes in a tasty chewable tablet, which most pets love. Enrofloxacin is sold per tablet and requires a prescription from your veterinarian. For pet use only. In rare instances, use of this product in cats has been associated with retinal toxicity. Do not exceed 5 mg/kg of body weight per day in cats. Safety in breeding or pregnant cats has not been established. Keep out of reach of children. What is the most important thing I should know about Enrofloxacin? Enrofloxacin is a a prescription medication used for the treatment of susceptible bacterial pathogens. What should I discuss with my veterinarian before giving Enrofloxacin to my pet? Tell your veterinarian if your pet has or may have any central nervous system disorders. Quinolone-class drugs should be used with caution in pets with known or suspected central nervous system disorders. In rare instances quinolones have been associated with central nervous system stimulation which may lead to convulsive seizures. Quinolones have also been associated with cartilage erosions and weight-bearing joints. In cats, such products should be used with caution due to reported adverse affects on the retina. How should Enrofloxacin be given? Enrofloxacin should be administered orally to cats and dogs for the treatment of susceptible bacterial pathogens. Pets that receive dosage at the upper end of the dose range should be carefully monitored for clinical signs that may include inappetance, depression, and vomiting. 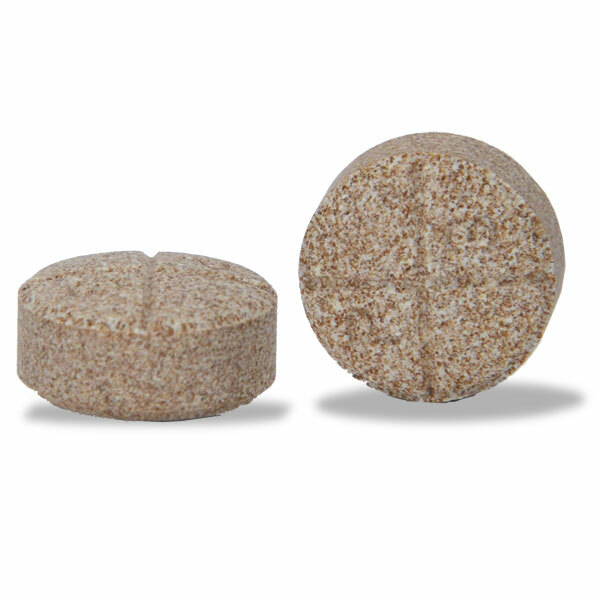 For Dogs: Administer orally at a rate to provide 5-20 mg/kg (2.27 to 9.07 mg/lb) of body weight. For Cats: Administer orally at a rate to provide 5 mg/kg (2.27 mg/lb) of body weight. Give either as a single dose or divided into 2 equal daily doses administered at 12 hour intervals. The dose should be continued for at least 2-3 days beyond cessation of clinical signs, to a maximum of 30 days. What are the potential side effects of Enrofloxacin? Although rare, some adverse reactions have been anorexia, diarrhea, vomiting, elevated liver enzymes, ataxia, seizures, depression, lethargy, and nervousness. There have been no side effects reported in cats. The use of Enrofloxacin is contraindicated in small and medium breed dogs during the rapid growth phase (between 2-8 months of age) and has not been established in large and giant breed dogs during the rapid growth phase. What happens if I miss giving a dose of Enrofloxacin? Give the next dose of Enrofloxacin as soon as you remember. If it is close to the next scheduled dose, skip the missed dose and resume the regular schedule. Do not double the dose. What happens if I overdose my pet on Enrofloxacin? If you suspect that your pet has received an overdose of Enrofloxacin, consult your veterinarian or emergency veterinary clinic immediately. What should I avoid while giving Enrofloxacin to my pet? Avoid giving your pet sucralfate or antacids, which may interfere with the absorption of enrofloxacin. Oral iron may also decrease enrofloxacin absorption. If these medications must be given, they should be administered two hours apart. What other drugs will affect Enrofloxacin? 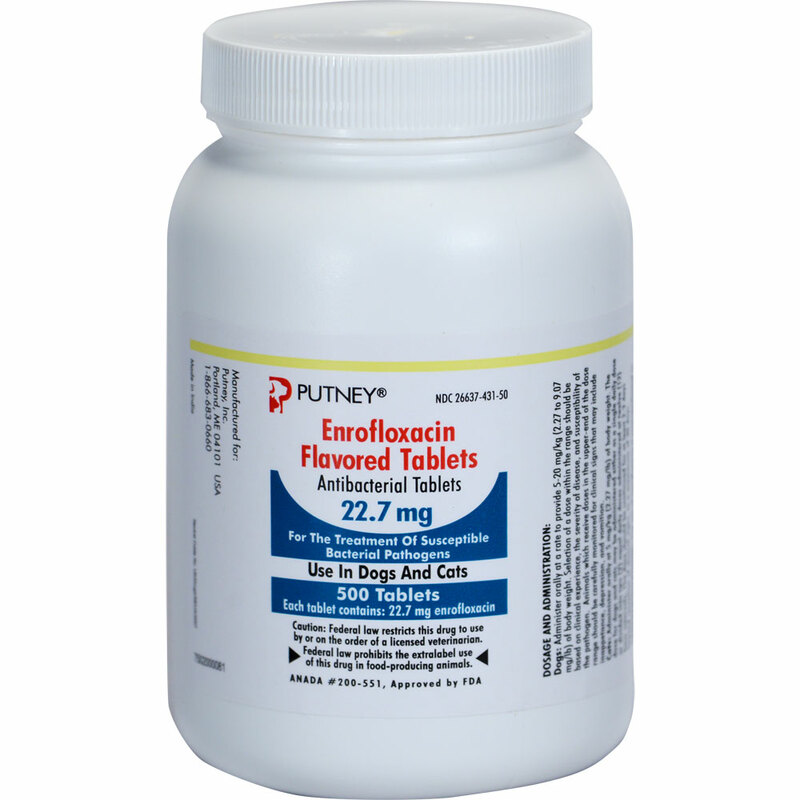 Enrofloxacin may interact with bronchodilators such as aminophylline and theophylline. It may also interact with cyclosporine, flunixin, methotrexate, nitrofurantoin, phenytoin, probenicid, and warfarin. Consult your veterinarian to proper dosage instructions. Administer orally at a rate to provide 5-20 mg/kg (2.27 to 9.07 mg/lb) of body weight. Administer orally at a rate to provide 5 mg/kg (2.27 mg/lb) of body weight.